World Famous Aluminet "Cool Shade" Silver Mesh is a highly reflective Aluminized Knitted Shade Fabric that provides significantly cooler shade. 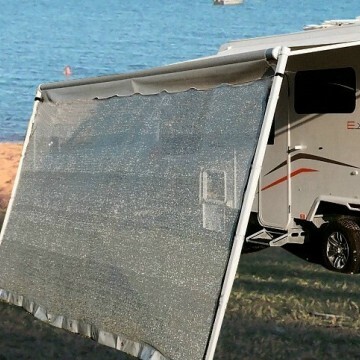 Silver Eagle's Aluminet Privacy Screen is an ideal Caravan / RV accessory to add to your Roll Out or Box Awning. This lightweight Reflective screen is simply installed by threading the inbuilt spline along the annexe track / groove into the awning. Purchased a 4.8m Silver Screen for my trip around Australia. The fabric weave allowed plenty of fresh air to pass through whilst blocking the sun out completely. Great new product! ...Matt from Vic. on each item we sell with the exception of any items listed below. If the item is not the correct size or does not meet the needs of your application, we will either exchange your product or refund the cost of your item, less any associated freight costs.